Students from Thailand currently working for Morey’s Pier paid a visit to the sixth grade class at St. Ann Regional School recently. The university students who range in age from 20-22 presented a power point presentation about their country and culture. 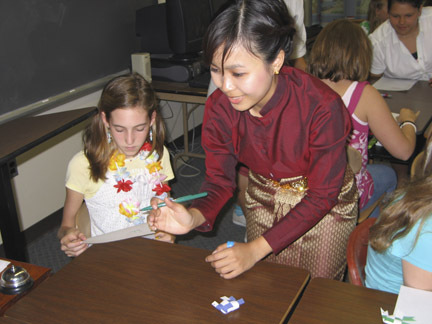 Above, one of the university students shows Monica Powers how to write her name in Thai.